My name is Chelle Morrison, I’m the owner of Urban Betty Salon and I’m also a hairstylist. 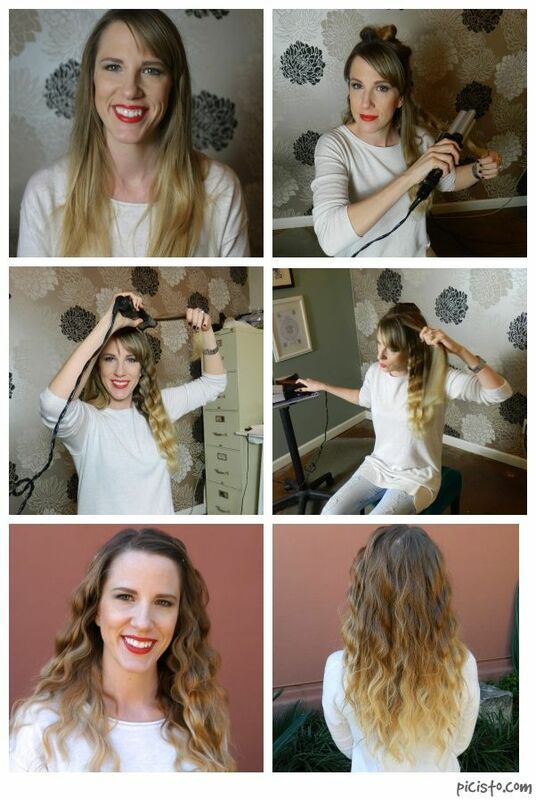 I’m going to be demonstrating how to use a deep waver iron so you can have natural looking beachy waves. What tools are you using to achieve this look? The tools I will be using to achieve this look are a deep waver iron, 1 crocodile hair clip for sectioning, and 1 large comb. What products will you be using or what have you already done to your hair to prep it? I shampooed and conditioned my hair with Bumble and Bumble Mending Shampoo. I then sprayed Bumble and Bumble Prep throughout it to detangle with a bit of Milk by Reverie through the mid shaft and ends. Next I sectioned and blew it dry thoroughly. Make sure that your hair is completely dry before using the waving iron so as not to burn your hair. If you have lots of natural curl, please straighten your hair as much as possible with only the blow dryer. The key is too smooth it out with only the blow-dryer. Never use a flat iron or other type of iron before you use a waving iron. First I’m going to section my hair horizontally across the back only, I’ll use the crocodile clip to pin the rest to the top of my head. Make sure that your sections are only as thick as the diameter of the iron. That helps to prevent grabbing too much hair. I usually break the first section into two pieces and comb through them before using the iron. I bring the section to the side and begin using the waver at the top. I then move the iron down the section. Be sure to incorporate part of the last waving pattern in your next move to keep the wave fluid. Next I’m going to move up the back of my head in horizontal sections until I reach the crown of my head, leaving each section down that has already been waved. I usually take 2-3 sections within each section. When you finish that and reach the top of your head, start with your sides. Work your way up to the top of your head horizontally again. Make sure you work towards your part. Always wave your hair in the direction of where you part your hair, never away from it. I part my hair slightly off center, so it makes it easier to section. If you have bangs, I suggest not using the waving iron on them. Because if they are not long enough, it can cause a weird outcome. Only use the waving iron on hair in the front that is 6 inches or longer. Since I have bangs, I have dried them smooth and will bobby pin them back into the rest of my hair. After pinning my bangs back into the rest of my hair, I loosely run my hands through it. You can flip your head upside down as well to break up the waves. Never comb through the waves! That can cause frizz. I apply a bit of Bumble and bumble Brilliantine through the bottom to create separation and add to the beachy look. Just a dime sized amount is all you need. What do you like about this style and why do you do it? I love having wavy hair and the ease of it. It looks natural and I can easily wear this same style without washing it for 3 or more days. In fact the longer I go the better it looks. This is a great hairstyle for humid and rainy days; it only makes it look more natural!